In ancient China, Taoist developed a profound understanding of life based on observation of nature which called Wu Xing or the Five Elements. The Elements represents transformation that occurs around us which interact and relate to each others. Despite of Five Elements concept is old, but the concept can be applied to our modern life. Wu Xing (Chinese: 五行; pinyin: wǔ xíng) also known as the Five Elements is a fivefold concept that many traditional Chinese fields used to explain a wide array of phenomena. This concept of Five Elements was used to describe interactions and relationships between phenomena, such as Feng shui, astrology, traditional Chinese medicine, music, military strategy, and martial arts. The Five Elements are Wood (木 mù), Fire(火 huǒ), Earth (土 tǔ), Metal (金 jīn), and Water (水 shuǐ). Wood Element is yang/masculine character which represents the pioneer that can do strategic plan and directing. One quality of Wood Element is leadership which needs to be strong and flexible, like bamboo. The leaders that can take charge, determine a plan of action, and always seek to grow. Fire Element is yang/masculine character which represents the wizard that can do socializing and marketing stuffs. This Fire Element associated with the qualities of dynamism, strength and persistence. It provides warmth, enthusiasm, and creativity which match with the marketing person. Earth Element is a balance of both yin and yang. It represents the mediator which associated with patience, thoughtfulness, practically, hard work, and stability. The Earth Element seeks to draw all things together in order to bring harmony and stability. This element represents human resources. Metal Element is is ying/feminine character which represents the alchemist which is organizing and judging. This element represents the minerals, crystals, and gems of the world. This element is the breath of life. This element associated with the qualities of metal which are unyieldingness, rigidity, persistence, strength, and determination. 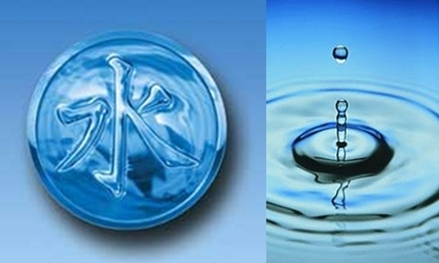 Water Element is ying/feminine character which represents the philosopher and thinker. Water Element associated with intelligence and wisdom, flexibility, softness and pliancy. Water can be fluid and weak, but it can also be a great power when it floods and overwhelms the land. Every element has its own strengths. These elements are actually related to each other because it can control one another. For example, fire controls metal because it can melts metal into liquid. Water controls fire because water extinguished a fire. Earth controls water because earth absorbs water. Wood controls earth because it holds the earth together and can also break it apart. Metal controls wood because metal can cuts down trees into wood. This Five Elements represents the harmony of life. When a family, work team, or any organizations that have all of this five elements within its member, it is said that they would enjoy a lot of harmony. For example, in working place, if you are a leader of a company and are looking to hire people to work with you, it would be good to find people of signs that are “controlled” by you. 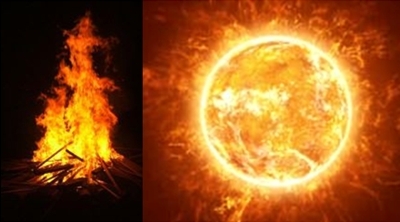 If you are Fire sign, you would find it best to employ people of a Metal Sign because like it is said before that fire controls metal. Chinese conceptual is interesting, including this Five Elements. This may not be true but believe it or not it may be true too, so you can considered it when you want to hire people and working with people in your organizations. Metal is important element which also included in Five Chinese Elements. Metal represents the minerals which are rigid, strong, and determine. Shanghai Metal Corporation which based in China is one of the leading businesses in the manufacturing of metalworking industry. We can produce and export the best quality of metal products, shipping containers, and service. We prioritize the efficient of manufacturing and environmental sustainability. Silver Water! Myth or Reality? First I heard about Silver Water from my mom. We used to have a bottle of water with a small silver spoon on the bottom. Once I asked her what’s for we need a silver spoon in the water, she told me that this little spoon will protect our family from any kind of disease. As I always believe my mother, I haven’t thought about it too serious until recently. Lets see is a Silver Water myth or reality? So, when my mom said that silver water will protect us from disease, she basically meant that silver is a specific metals which can stop the growth of germs and microbes on contact. Silver and copper are best known in this regard and are often used in commercial applications. Among germicidal metals, however,silver is of greater importance because it is the only metal that is completely non toxic to the body. In fact, silver has been used since ancient times to not only keep stored water “sweet” and germ free, but also to speed the healing of wounds and minimize the formation of scar tissue. Also I even read an amazing story about a miracle effect of a silver water which helped to cure a bone infection. Check the article if you’re interested. 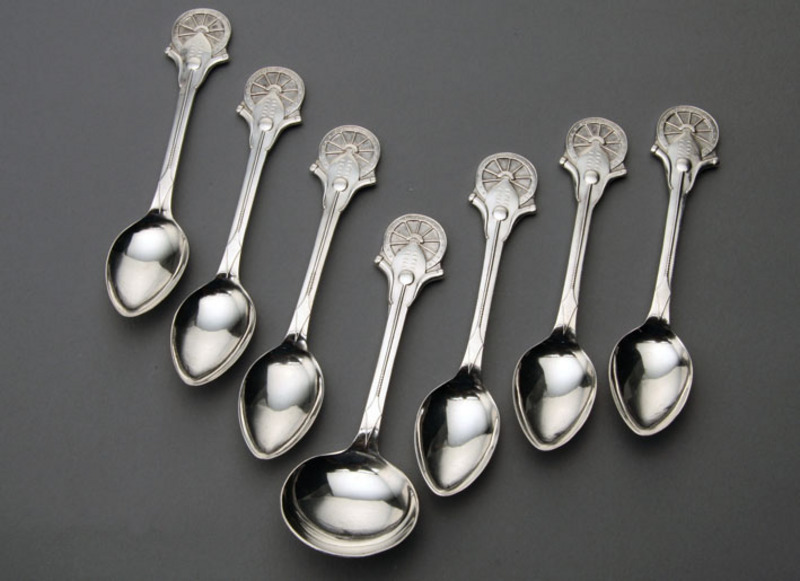 Just think about, silver is everywhere… we are eating off silver plates, storing our water and wine in silver vessels, drinking from silver cups and eating with silver utensils. But if the main purpose of a still water is disinfection, what stops us of buying a pure water which is also have a wide list of a good recommendations? I guess it’s all up every person decision. Here the link to the silver water company where you can find more detailed information. Also you can check our website to read and know more about silver and any related products or send us your inquiry, we have English-speaking stuff that will help you to find the best product for you. Don’t forget to follow us on social media and download an application by scanning QR code below. Looks Prettier than It Costs! Are you tired of high water bills? Think it’s too much effort maintaining your gardens and football pitch? Well, at SMC, we have the solution to your gardening problems! Artificial lawn is becoming more and more popular by the day, as it is ever-green all year round, requires little maintenance, has easy installation, and creates a breath-taking scenery, and most of all saves you from high water bills! At SMC, our building systems subsection is concerned about all your building needs. Enhance the look of your gardens and sports arena with our artificial grass! While you are at it, take it up a notch and incorporate our shipping containers which you can recycle to create extra living space with an open patio setting. Recycled containers used in design and decor, are a great architectural success to creating contemporary gardens! They allow you to create your own lush and unique garden, at minimal cost. SAY BYE-BYE TO WATER BILLS and HELLO to beautiful lush gardens all year round! NO lawn mowing, no pruning, no watering! You save a lot! SMC is a professional artificial grass manufacturer and is one of the leading building systems supplier in China. Having a world-wide market, we produce world-class artificial grass from synthetic turf; which is widely used in home gardens, golf landscape, and sports arena. Moreover, our artificial grass is also safe for children to play on, hence it’s perfect for school play grounds. Enjoy beautiful views in your homes and sports arena with our artificial grass, with no fuss of high maintenance. At SMC, we understand the problem of water scarcity; so come to SMC to save water and pay less money for your water bills and garden maintenance personnel. All that cost forgone is accompanied by breath-taking landscape architecture! Read more about how best we can meet your building system needs by visiting our website or make an inquiry. Providing a safe drinking-water is still one of the major concerns in most of developing countries. Water purification methods exist, but they are expensive and therefore, not easily accessible for many people. 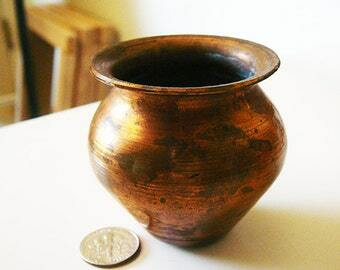 In ancient time, people in India believe that drinking water stored in a copper vessel gives benefits for your health. According to the Hindu traditional medicine, Ayuverda, copper is believed to possess anti-microbial, antioxidant, anti-carcinogenic and anti-inflammatory properties. Thus, making it perfectly fit for the drinking purpose. But is there any scientific evidence that support this believe? Let us find out. A recent study (2012) has evaluated the effect of copper vessel on a contaminated drinking water by storing it in a copper vessel for 16 hours. The result was satisfying and showed that copper vessel can be use as a cheaper solution for especially developing countries to have a more easy access to drinking-water. 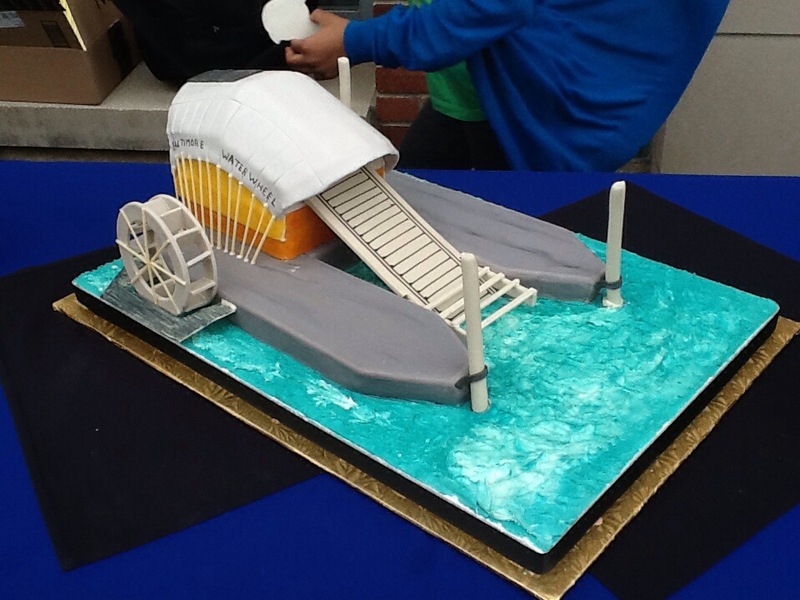 One of the best part about this material is that it never becomes stale and can store water for long periods of time. The benefit of copper doesn’t stop here ! Copper is an essential nutrient for our body and have diverse roles in biological electron and oxygen transportation. 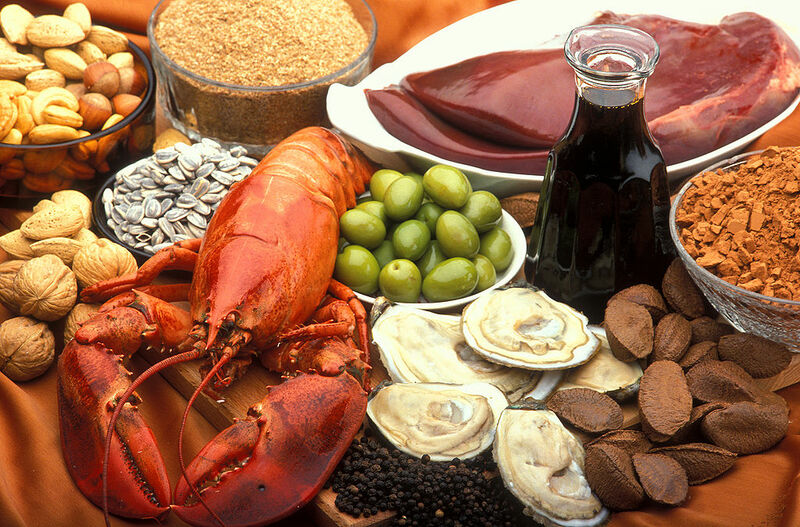 It can be found in several food such as beef, oyster, lobster, cocoa, black pepper, nuts, sunflower seeds, avocados, etc. Taking water stored in a copper vessel can help you to supply your daily requirement of copper. If you’re interested in getting this copper vessel, Shanghai Metal Corporation produces slitting, edging, and oscillate winding to fit your specific copper requirements. To find out more, please check out our website or send us your inquiry. We have English speaking staff that will guide you to find your wanted product with the best quality and price. Don’t forget to follow us on Social Media to get news about our product and company. 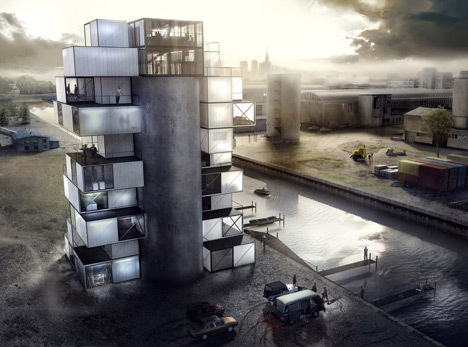 The new application possibilities of shipping containers have already managed to attract the attention of various communities including artists, designers and architects. Universities are also applying shipping containers in their research on engineering, arts and human sciences. Here we will present some examples. As we can see through these examples, the academic communities worldwide contribute to finding new applications for shipping containers. New applications attract new stakeholders and create more demand. The catch of this story is that no matter how many applications they come up with, the standardized shipping containers themselves will stay the same. They will also be provided by Shanghai Metal Corporation. You can visit our website to find more details about our shipping containers. Check also our social media platforms for future updates. 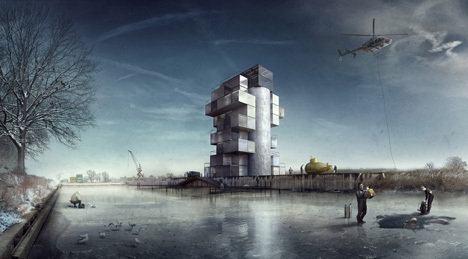 A Polish design studio MOKO Architects an extreme sports venue that will be built on two abandoned concrete silos and a series of shipping containers. A 25 meter twin tower in 12 km from Warsaw’s nucleus will be built during 2015. 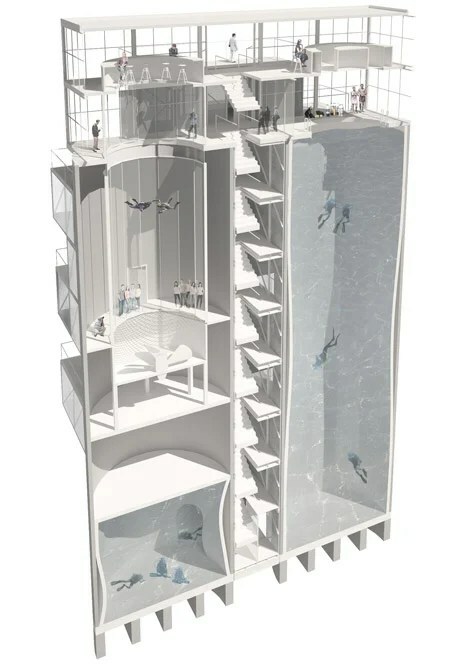 One the 25 meter towers will be completely filled with water. On the top people can dress their scuba wear and dive into the depths. In the bottom there is a cave that takes to the other tower. The rest of the other tower will be built for exercising skydiving. Shipping containers will be used to build additional facilities to support the visiting extreme sportsmen. The containers will be turned into offices, kitchens, hostels, changing rooms, reading rooms, exhibition centers and cafeterias. This a great example on how environmental conditions can be enhanced by putting used material into reuse. 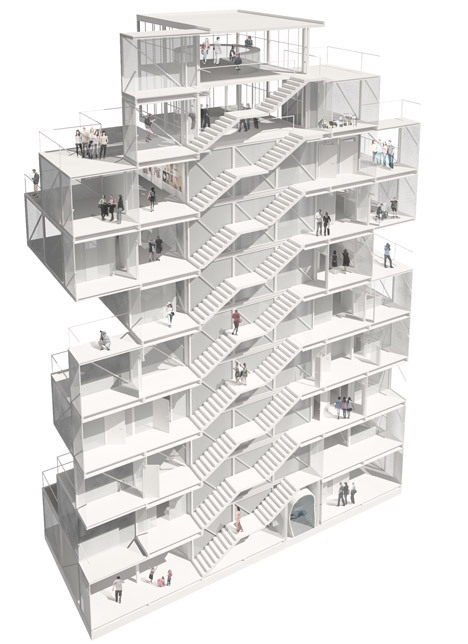 It also shows how already existing structures, in this case silos and shipping containers, can have new applications that many people have never thought before. 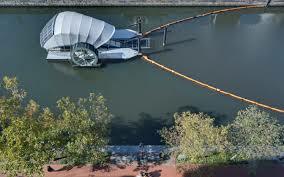 A same kind of sports venue could also be built by replacing the silos with oil tanks making the diving section wider. We sell high-quality oil tanks and shipping containers in Shanghai Metal Corporation. You can see details in our webpages. For any inquiries and questions, please use this form. Check also our social media platforms for future updates. Please use the the social media boxes below to SHARE this article to reach all the people interested in container architecture everywhere.